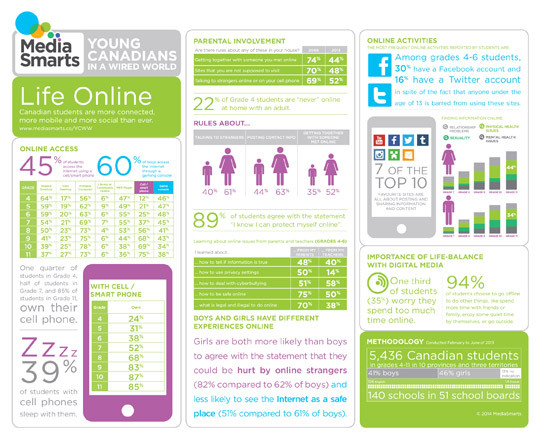 The Young Canadians in a Wired World, Phase III: Life Online “report is drawn from a national survey of Canadian youth conducted by MediaSmarts in 2013. The classroom-based survey of 5,436 students in grades 4 through 11, in every province and territory, examined the role of networked technologies in young people’s lives. Life Online (the first in a series of reports from the survey) focuses on what youth are doing online, what sites they’re going to, their attitudes towards online safety, household rules on Internet use and unplugging from digital technologies” (MediaSmarts, 2014).